There’s nothing more annoying than leaving your wax appointment with silky smooth, beautiful skin only to be blighted by ingrown hairs a couple of days later. 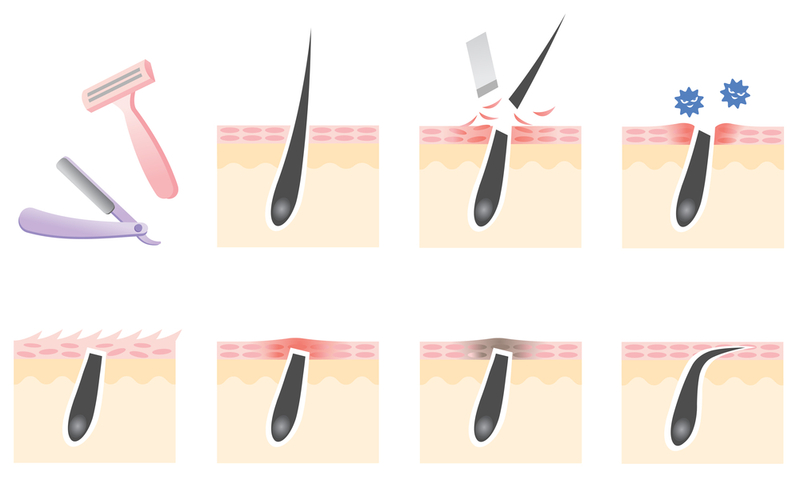 Ingrown hairs can appear after waxing or shaving as the new hair gets trapped underneath the surface of the skin. Those who wax regularly may notice that their hair gets thinner or finer. This can make it harder for the hair to emerge from the skin, leading to ingrown hairs. They can be itchy or painful but aren’t harmful unless they become infected. Don’t worry though, there is plenty that you can do to treat or avoid them. You’re not alone in your fight against these unsightly blemishes! Our expert therapists at The Wax Bar have got a whole regime that they follow to help you avoid ingrown hairs. I say this in my sleep – EXFOLIATE. Be sure to exfoliate the area 2 -3 times a week. This will remove the dead skin cells and help the new hair to push through the skin as it grows. Try using Lycons amazing sugar body scrubs! It might be tempting but, DO NOT PICK or SQUEEZE ingrown hairs as this can damage the surrounding area and also leave it open to infection. Lycon Ingrown X-It Solution is our number 1 best-selling skin care product. It contains a blend of Salicylic and Lactic acids to decongest the skin, Arnica to help minimise redness and swelling and Allantoin to moisturise and soften the skin. Use Lycon Ingrown X-It Solution once or twice a day as long as necessary. An anti-bacterial wash or moisturiser can be beneficial in the first couple of days after waxing or shaving as it will keep the area clean and infection free. We love the Lycon Tea Tree Total Washfor it’s refreshing and uplifting scent. Moisturising the skin daily also helps as it softens the skin and makes it easier for hairs to push through without causing problems. It’s no good doing these things the day before a wax. You need to build them into your daily regime for them to have a long-term impact. Trust us! We have been keeping Norwich hair free for 10 years. Why not come and pay us a visit and let’s get rid of those ingrown hairs!